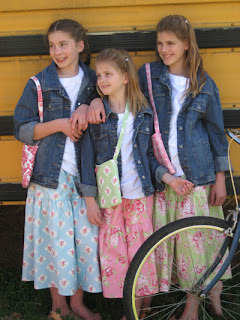 Hope's Cafe: Marie Madeline Studio Denim Skirts-Review and Giveaway!! Marie Madeline Studio Denim Skirts-Review and Giveaway!! Marie Madeline Studio is a family-business that offers custom-made apparel for ladies and girls, as well as a variety of sewing patterns and fabrics. They have beautiful skirts, aprons and bloomers, any of which would make great gifts for your daughters or a friend! "The idea for our family business was hatched in the winter of 2006, when we girls began sewing one-of-a-kind handbags for family and friends. We officially launched marie-madeline studio in December 2007. Since then, our creative endeavors have grown to include bags of all shapes and sizes,aprons, little girls' clothing, and ladies' clothing. Our exclusive marie-madeline sewing patterns debuted this year, and our favorite fabric lines are now available to our customers through our online fabric store! The ready-made products we offer are all handcrafted, by the five of us, in our home studio. Thank you for taking time to stop by our little corner of the world!" And guess what? Marie Madeline Studio is giving a Custom-Made Route 66 Denim Skirt to one of my readers!!! Go to Marie Madeline Studio and tell me another product you like! 1 entry-Sign up for the Marie Madeline Studio Newsletter. Leave me a comment. This giveaway ends Monday, November 1, 2010 at 11:59 p.m. Please leave a valid email address in each comment, as this is how the winner will be notified. Winner will have 48 hours to respond, or another winner will be chosen. Giveaway open to US residents only. Disclaimer:I was not monetarily compensated in any way for this review. I did receive product for the purpose of review. All thoughts and opinions are mine. All quotes taken from the Marie Madeline Studio website. I like the custom crafted laraine shoulder bag. the gracie ruffle skirt is my fav! The ricrac on the bottom is a sweet touch. I like their Street Fair Skirts. Please enter me. Thanks!! I entered the Pureology giveaway too. I also entered the Wall Decal giveaway. I entered the Aroma Home giveaway. I entered the Christa Taylor Apron giveaway. I entered your Tukaiz Calender giveaway. I entered the Lulu giveaway. I also entered the ALO giveaway. I entered the Education Outdoors giveaway. I entered the Oh Girly giveaway. I signed up for the MM Newsletter. I like the Tessa Bloomers. I hope I win! I follow you on Twitter. PI of Products.